Dave and I have just returned from the South of Italy and we sampled quite a few versions of sfogliatelle while we were there. I nearly made a savoury version for the simple snacking challenge but I chose not to as I thought I had enough on my plate already (both literally and figuratively speaking). So, when I saw that this month’s Daring Bakers challenge was to make sfogliatelle I was really excited. I knew exactly how they looked and how they tasted and all I had to do was figure out how to make them. We were also given a few mandatory Items: Sandie provided recipes for homemade ricotta cheese (so easy and so delicious), candied orange peel, sfogliatelle ricci and frolle dough. You must make the homemade cheese or the candied peel and at least one version of the sfogliatelle. I chose to make my own candied peel as I cannot buy commercial peel as it is full of sugar. My first attempt at the sfogliatelle was an absolute disaster. I think this had to do with the extreme heat we experienced on Sunday. I was not quite sure if I would get the recipe done in time for the reveal due to the time constraints of working and the amount of time the dough needs in the fridge. I was so relieved when last night I managed to get three sfogliatelle made. They might need to have been a bit thinner, but Dave and I both recognized the texture as being spot on! These are not easy to make, but I am so glad that I have achieved this. 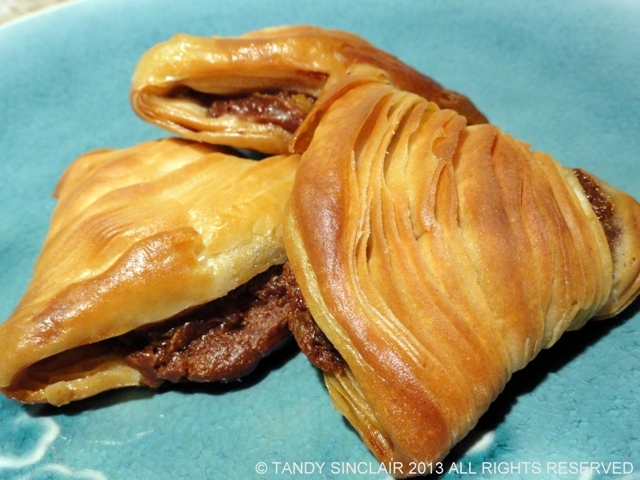 I hope you all enjoy my recipe for chocolate and orange sfogliatelle. Those look unbelievably good – crunchy and chocolatey – heaven! I’ve never heard of this pastry but it looks so tempting and delicious! Beautiful work! That looks so yum Tandy! Do you serve it warm? Great effort and wonderful looking pastry. Your very lucky to have tasted this in Italy. We have never tried this. It looks great! I don’t like giving up! A great excuse to go back indeed! Those million layers!! I’m so impressed! I hope it is on your Christmas wish list! They look fabulous Tandy! My post goes up tomorrow. I found the pastry so interesting and challenging and I’d imagine that if it was really hot, it would be really hard to work with!